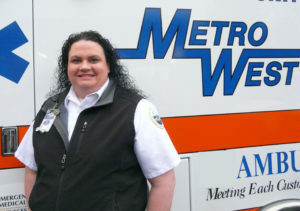 Melissa joined Metro West Ambulance on April 17, 2000 as a BLS provider in the non-emergent wheelchair transport division. Over the years, Melissa has held many positions within the company, such as shop manager, ambulance department supervisor, and dispatch supervisor. Melissa’s internal desire and strive to learn all there is to know in EMS and in the organization is commendable. During the last year while fighting a very brave battle with cancer, Melissa has still been able to maintain her position as Logistics Manager, Chief of Staff, supervisor to the Vehicle Service Technicians, and supervisor of the Vernonia Ambulance Volunteers. Melissa will frequently staff openings in the 911 system and, in her spare time, volunteers at River City Speedway as one of the emergency responders during their racing events. Despite her commitment to volunteer work and difficult battle with cancer, Melissa has remained dedicated to her career as an EMS provider, through both her duties at Metro West Ambulance as well as her support of her community. It is Metro West Ambulance’s pleasure to nominate Melissa Zimmer as a 2017 Star of Life.